Union chief Fraser Wishart is not sure if the nine players axed by Dundee are free to find other clubs immediately. "There's a feeling of numbness around," Wishart told BBC Scotland after the administrator running Dundee announced a raft of drastic money-saving cuts. "The players who have kept their jobs are not feeling any elation. In some cases, there's even a feeling of guilt. "Technically, we are outside a transfer window. Can the players sign for some other club?" Dundee are struggling with debts of £2m, of which £420,000 is owed to the tax authorities. Manager Gordon Chisholm and his assistant Billy Dodds were made redundant, along with players Brian Kerr, Mickael Antoine-Curier, Eric Paton, Dominic Shimmin, Njazi Kuqi, Paul McHale, Scott Fox, Colin McMenamin and Charlie Grant. All of the laid off staff now join the list of the club's creditors. "Contracts are protected by registration, that's something we fight for as a trade union, but unfortunately they now find themselves redundant," explained Wishart. "We'll be asking the Scottish Football League to make sure, longer term, that our members are not disadvantaged. "So, I think the SFL would make a new Dundee pay some mitigated losses, but that's further down the line. "Our members now have to find employment as quickly as possible. There's all sorts of paperwork and Fifa regulations. 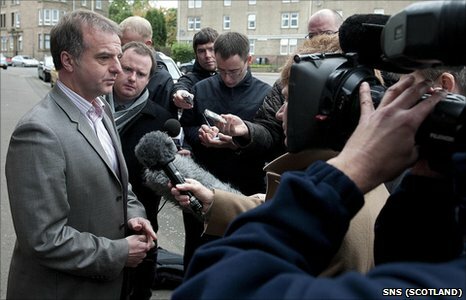 "I'm going to have to ask the Scottish FA and they will have to ask Fifa. It's ridiculous." Administrator Bryan Jackson has given the First Division outfit a 50-50 chance of survival and Wishart shares concerns that the situation is grave. "The message to get across is that this is not an administration that's going to toddle on for six months, 12 months, 18 months," he added. "This is a club that needs funding quickly. "It needs a new owner, if possible, or it needs funding to give the administrator the opportunity to run the club for longer. "Dundee are fortunate to have Bryan Jackson in charge. He's a man with experience in football and a man I have dealt with. When you ask a straight question, you get a straight answer. "There are savage cuts across the board but he has given the club the opportunity to survive."